Opening in present day, a 911 operator receives a call from Bloodyface, reporting the imposters. He has festooned the foyer with them, in one of the most metal scenes of the season thus far. Sam Goodman confirms Anne Frank/Charlotte Brown’s story of Arden’s history, but needs Arden’s fingerprint to confirm. Jude realizes Mrs. Reynolds has abandoned Jenny, and sets Sr. Mary Eunice to babysit. 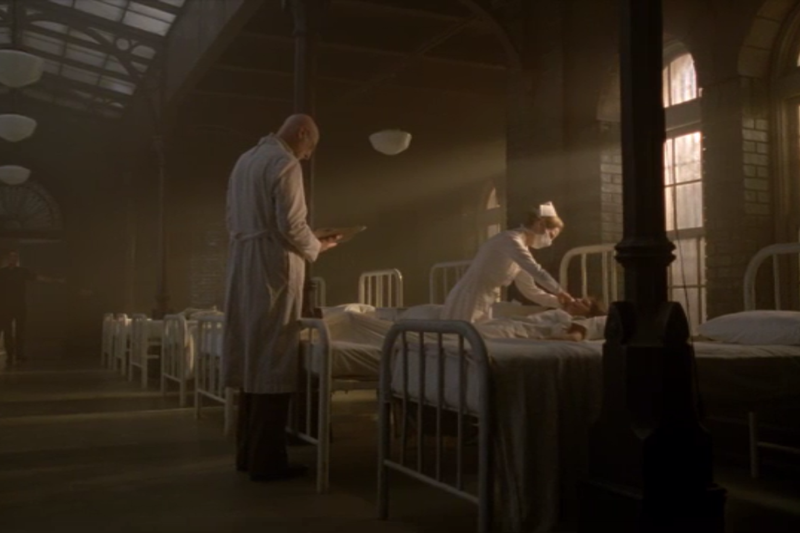 Dr. Arden, Briarcliff TB hospital. 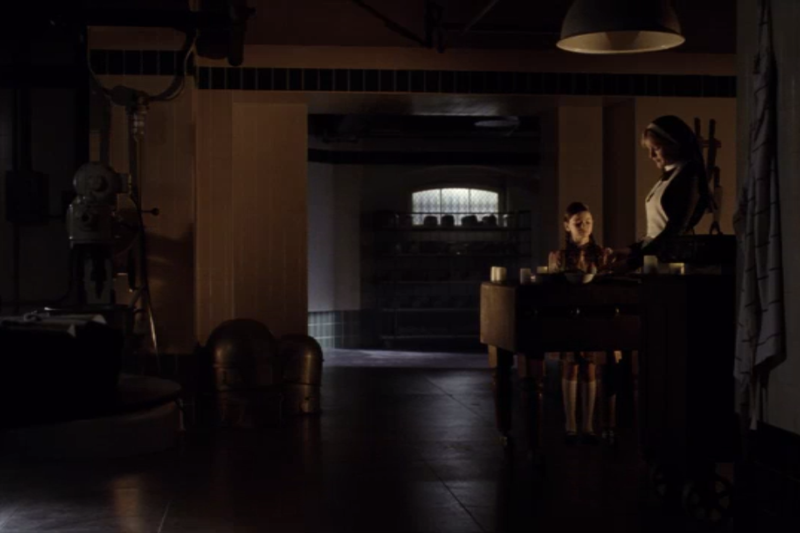 “Briarcliff is a receptacle for human waste, each patient a perfect example of an evolutionary failure.” Arden recalls Mr. Spivey touching himself as he spies on Sister Mary Eunice. “When they arrived here these patients were less than men. Now, because of me, they’re more than human.” He considers himself to be improving the human race to withstand nuclear war, speeding up the evolutionary process. When Timothy threatens to expose him, he counters, “If you open that window the light will illuminate everything… And I do mean everything.” The only answer is to eliminate their common threat. Sister Mary Eunice watching Jenny quickly proves a terrible idea. Mary Eunice admits to being the devil, telling the little girl, “You were born with the gift of authentic impulse,” and that time spent trying to be ‘good’ and loved is a fruitless waste. Timothy exiles Jude to Pittsburgh, where she’ll oversee a home for wayward girls. Inspired by Mary Eunice’s farewell, Jude is determined to fingerprint Arden before she goes. Sister Satan Mary Eunice gives most of the evidence to Arden, but has hidden some away, “In case you try and double-cross me.” Arden defends his work, lamenting his lonely path as a visionary, but she cuts him off, saying he’s preaching to the converted. He sees through her pretending she’s in love, but she says, “All you need to do is trust in me with your entire soul.” If the devil is expending so much effort to court Arden’s soul, perhaps he’s not yet beyond redemption. Jenny is under the bridge where she killed Josie, this time with an entire dead family at what used to be a picnic. As she tells detectives about the bearded man with a brown coat, she twirls a souvenir lock of hair in her fingers. Bloodyface lingers over Lana with a scalpel, explaining he was watching her before Briarcliff as she covered Kit Walker’s arrest. In a last effort to save herself, she comforts, “That’s alright, Oliver. I don’t want you to feel guilty. A mother’s love is unconditional. You never had that, did you? Everyone deserves that. Even you, baby.” He removes the Bloodyface mask, emotionally telling her that baby needs colostrum before nursing at her breast. In present-day, detectives find Leo’s car and lower the imposter Bloodyfaces. As they receive another call from Bloodyface explaining he only killed the imposters, he is shown with a still-alive Teresa. “Origins of Monstrosity” juxtaposes various characters and their growth progressions. Jenny, being the youngest, is obviously at the beginning of her journey into monstrosity, and is nourished by Sister Mary Eunice’s encouragement. 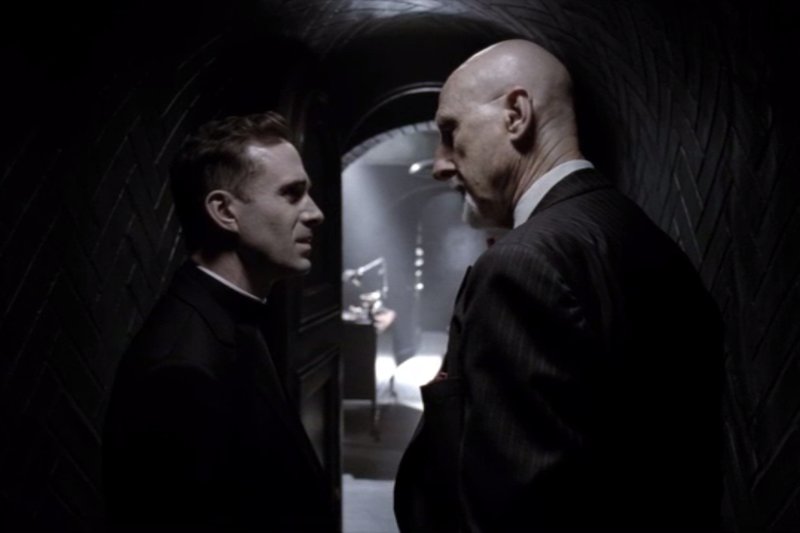 Monseigneur Timothy also seems a neophyte under the ambitious wing of Dr. Arden. Though the former is beginning to reconsider his involvement, Arden threatens him with exposure, leading one to wonder what other dark dealings Timothy has become involved in. Arden is firmly locked in his path, determined to see it through. Meanwhile, Dr. Thredson seems willing to put his monstrous deeds behind him and work toward recovery, if Lana will sacrifice herself to fulfill his need of a loving mother (Though judging by the 2012 scenes reminding us Bloodyface is still in action, this will not go as planned). A multitude of options are presented for the creation of evil here. With Jenny, who has a concerned mother that has raised two perfectly normal siblings, the theory of bad seeds is explored. Thredson presents the nature vs. nurture argument, in which killers are not born, but made. In his case the lack of nurturing in his childhood left him with a longing for human contact and an unhealthy means of achieving it. Arden and Monseigneur Timothy have compromised their knowledge of what is morally right and good in favor of what will benefit them the most; they are willing to perform despicable acts out of self-interest. Finally, Sister Mary Eunice suggests that one can simply become possessed by dark forces, and knowingly abandon the pursuit of good. I am very much into AHS myself. I’m currently debating and going through some theories from what we saw in episode 6 and what can me seen in the episode 7 trailer. Feel free to jump in with any ideas 🙂 Just be warned I am letting my imagination run a little crazy (but then the whole season is just that). Interested to see how your Bloodyface-gets-an-apprentice theory works out! I try not to watch the episode trailers and previews so I’ll refrain from speculating with you on episode 7’s reveals!